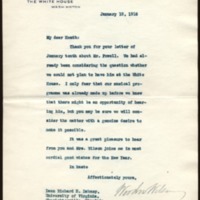 Thank you for your letter of January tenth about Mr. Powell. We had already been considering the question whether we could not plan to have him at the White House. I only fear that our musical programme was already made up before we knew that there might be an opportunity of hearing him, but you may be sure we will consider the matter with a genuine desire to make it possible. It was a great pleasure to hear from you and Mrs. Wilson joins me in most cordial wishes for the New Year. Wilson, Woodrow, 1856-1924, “Woodrow Wilson to Richard Heath Dabney,” 1916 January 13, WWP20507, University of Virginia Woodrow Wilson Letters, Woodrow Wilson Presidential Library & Museum, Staunton, Virginia.